Isaac I Komnenos (or Comnenus) (Greek: Ισαάκιος A' Κομνηνός, Isaakios I Komnēnos; c. 1007 – 1060/61) was Byzantine Emperor from 1057 to 1059, the first reigning member of the Komnenos dynasty. During his brief reign he attempted to restore the depleted finances of the empire and the former strict organization of the government. Isaac was the son of Manuel Erotikos Komnenos, who reportedly served as strategos autokrator of the East under Emperor Basil II, and defended Nicaea against the rebel Bardas Skleros in 978. Manuel's native language was Greek; according to Steven Runciman, he was either Greek or a Hellenized Vlach. It is said that the family name was derived from the city of Komne, near Philippopolis in Thrace. Manuel came to the notice of Basil II because of his defence, in 978, of Nicaea against the rebel Bardas Skleros. In recognition of Manuel's loyalty, Basil gave him lands near Kastamuni in Paphlagonia. On his deathbed in 1020, Manuel commended his two surviving sons Isaac and John to the emperor's care. Basil had them carefully educated at the monastery of Stoudion and afterwards advanced them to high official positions. Manuel also had a daughter, born in 1012 and married around 1031 to Michael Dokeianos, Catepan of Italy, deceased in 1050. During the disturbed reigns of Basil's seven immediate successors, Isaac by his prudent conduct won the confidence of the army. From 1042 to 1057, he served as commander of the field army in Anatolia. In 1057, after being humiliated by the Emperor, Michael VI, he rebelled in Paphlagonia and joined with the nobles of the capital in a conspiracy against the Emperor. The army proclaimed Isaac emperor on June 8, 1057, and he defeated an imperial army at the Battle of Petroe. A panicked Michael VI attempted to negotiate with the rebels through the famous courtier Michael Psellos, offering to adopt Isaac as his son and to grant him the title of Caesar, but his proposals were publicly rejected. Privately Isaac showed himself more open to negotiation, and he was promised the status of co-emperor. However, during the course of these secret negotiations, a riot in favor of Isaac broke out in Constantinople. With the deposition of Michael VI, Patriarch Michael Keroularios crowned Isaac I emperor on September 1, 1057, taking much of the credit for Isaac's acceptance as monarch. Gold nomisma struck by Isaac. 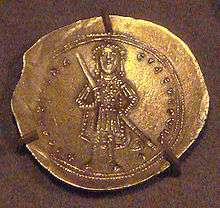 His martial posture, bearing a naked sword, is unique among Byzantine imperial coinage. The first act of the new emperor was to reward his noble partisans with appointments that removed them from Constantinople, and his next was to repair the depleted finances of the empire. He revoked numerous pensions and grants conferred by his predecessors upon idle courtiers, and, meeting the reproach of sacrilege by Michael Keroularios with a decree of exile in 1058, he appropriated a proportion of the revenues of the wealthy monasteries. Isaac's only military expedition was against King Andrew I of Hungary and the Pechenegs, who began to ravage the northern frontiers in 1059. Shortly after this successful campaign, he concluded peace with the Kingdom of Hungary and returned to Constantinople. Here he became very ill, and believed he was dying. He was already deeply shaken after narrowly avoiding being struck by lightning while leaning against a tree on campaign against the Pechenegs, and he saw his illness as a sign of God's displeasure. This situation was exploited by the courtiers, led by Michael Psellos, who influenced Isaac to appoint as his successor Constantine Doukas, to the exclusion of his own brother John Komnenos. Isaac abdicated on 22 November 1059, against the wishes of his brother and of his empress Catherine of Bulgaria. Like Isaac, his wife and daughter entered a monastery. Although he recovered, Isaac Komnenos did not resume the throne but retired to the monastery of Stoudion and spent the remaining two years of his life as a monk, alternating menial offices with literary studies. His Scholia to the Iliad and other works on the Homeric poems are still extant. He died late in 1060 or early in 1061. Isaac's great aim was to restore the former strict organization of the government, and his reforms, though unpopular with the aristocracy and the clergy, and not understood by the people, certainly contributed to the continued survival of the Byzantine Empire. Isaac married Catherine, a daughter of Ivan Vladislav, the last Tsar of Bulgaria. Isaac raised her to Augusta. Following her husband's abdication, she appears to have co-reigned for a while with Constantine X, but eventually she too retired to the Myrelaion monastery under the monastic name of Xene. Manuel Komnenos (ca. 1030 – 1042/57), probably the "son of Komnenos" recorded as having been engaged to the daughter of the protospatharios Helios. He died sometime between 1042 and 1057. Maria Komnene (born ca. 1034), her beauty is remarked upon by Psellos, but she remained unmarried, and retired with her mother to the Myrelaion. ↑ ODB, "Komnenos" (A. Kazhdan), pp. 1143–1144. ↑ Varzos 1984, pp. 38–39. 1 2 3 4 ODB, "Isaac I Komnenos" (C. M. Brand, A. Cutler), pp. 1011–1012. ↑ Varzos 1984, p. 44. ↑ Varzos 1984, pp. 46–47. ↑ Varzos 1984, p. 47. ↑ Varzos 1984, p. 58. ↑ Varzos 1984, pp. 58–59. Kazhdan, Alexander, ed. (1991). The Oxford Dictionary of Byzantium. Oxford University Press. ISBN 978-0-19-504652-6. Runciman, Steven (1951) A History of the Crusades, Vol. I: The First Crusade, Cambridge University Press. Varzos, Konstantinos (1984). Η Γενεαλογία των Κομνηνών [The Genealogy of the Komnenoi] (PDF) (in Greek). A. Thessaloniki: Centre for Byzantine Studies, University of Thessaloniki.